I do drink sometimes, and each of the drinking sessions has been big lessons and realizations for me. Even the stupidest people are at their wisest best when they are 3 pegs down and the wisest of all do not mind/ hesitate behaving weirdly or saying something which they would have not said ever even on a gun-point, if they had their sanity with them. So, last night, I had a small, emergency kind of drinking session with Vineet. I love beer and stay away from whisky, although occasional rum. And I thought about “Ctrl + Z” moments in my life. 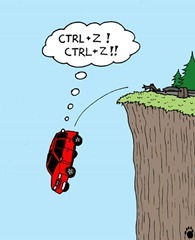 If you are reading this, you know Ctrl + Z. Thanks to Bill Gates; it is easy to undo your errors but only in computers. God has not made any provision of this kind in our life till date. But still I wish that we all should have some counts, like 2 or 3 occasions when we can undo/ reverse what we did and make a fresh start. “To err is human”- this was the most common line that I used to read in the Preface of my text books in school and colleges. What it meant that as a human, we are bound to make mistakes. There is no wrong in this until you are making stupid mistakes repeatedly. But some of them, even if made just once, leave a big impact on our life. And its not just our life, it sometimes involves our near and dear ones too and ever one of us is affected. And then you realize, this could have been easily avoided. Why I even did it? Sometimes, in ignorance or sometimes, not caring about the various consequences, we commit them. And we screw our life. I wish only if God has allowed us, in our whole lifetime, few chances to go back, erase every mark of what we did and make a fresh start; may be many miscommunications and differences that I have created with certain people would not have been there. I seriously hope that for the coming generations, God does think about this as our next generations will be more error prone. Let’s hope they have enough sanity with them to help their life runs smoothly. Previous Post The Value of "Values"